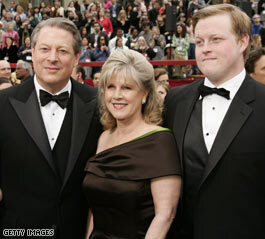 Al Gore III, right, appears with his father, former Vice President Al Gore, and mother, Tipper, at the Oscars in February. LOS ANGELES (CNN) – Al Gore III pleaded guilty Monday to felony and misdemeanor drug possession charges stemming from his arrest earlier in July when he was pulled over for allegedly driving more than 100 mph in a Toyota Prius. An Orange County Sheriff's deputy reported that he could smell marijuana when he approached the car. After conducting a search, the deputy found a small amount of marijuana and prescription pills - including Adderall, Vicodin, Xanax and Valium - all without a prescription. Gore, 24, was charged with two felony counts of possession of a controlled substance, two misdemeanor counts of possessing a controlled substance without a prescription, one misdemeanor count of possession of marijuana and a traffic infraction. Farrah Emami of the Orange County District Attorney’s Office said the son of former Vice President Al Gore agreed to enter a 90-day residential drug treatment program. Senior Deputy District Attorney Jaime Coulter told the Associated Press that if Gore successfully completed the drug treatment program the sentencing could be continued for another year and that charges may be dropped in 2009. "At that point, he will be able to withdraw his guilty plea as if he never entered it," Coulter told the AP. Gore’s next court date is scheduled for February 7, 2008. 1. Those who cannot give up dessert – most of the posters to this board I suspect – should be a little more compassionate toward those with a more serious problem and who have had the additional bad luck of getting caught. 2. Rich people are treated more gently by the justice system than are average citizens and a whole lot better than the poor. How can anyone older than ten be surprised or outraged by this? 3. The reason many posters are a little more gleeful when a Republican kid is busted for pot or a Republican Senator is caught attempting to seduce Senate pages is that Republicans are the ones who argue for the old fashioned boy scout virtues. They are the ones who argue for stiff penalties for drug use and child molestation, except in their own cases. He was guilty of driving over 100 miles per hour and guilty of posessing and using quite a few drugs. Don't act like he was alleged to have, he plead guilty, he did. It should really be up to the individual whether to use drugs or drive fast. What right does the government have in telling people to not use drugs for recreational purposes, and not drive the car as fast as they want? The government is supposed to exist so that the rights of people can be protected, not trampled upon! In Germany you can drive as fast as you want on the autobahns (freeways without speed limit), and in Holland you can smoke weed, and those countries have a much lower crime rate than the United States! Al Gore,Jr should spend less time trying to "save" the planet from "global warming" and spend more time with his family. Wake up America! It's time you get off your butts and do something except whine. You finally realize that there are rules for the rich and the laws are for the poor. find something better to do with you money. the people in Orange Country should kick that judge out of office (if she/he was elected). Just be thankful the ex-vp's son didn't kill some innocent person with his reckless behavior. This has got to be cannon fodder for the Republican hate machine. They love to go after Al Gore. "You know Al about that endorsement for my presidential candidacy that I asked you for"?ummmmmm maybe not. What the hell is the matter with most of you people? Do you honestly think Gore's son got "special treatment"? BULL! What he got was a non criminal answer to a non-criminal problem. How dense can some of you conservatives be? Drug abuse is a medical problem, NOT A CRIME!! And medical problems require treatment, not prison sentences and ugly criminal records. We don't discriminate against the ill people!! I myself was caught with drugs. And I got almost the same deal, and all charges got dismissed. A friend of mine got three separate charges and got a yearlong treatment program, and all charges dismissed. AND NEITHER OF US ARE RICH, NOR OUR PARENTS!!!! Special treatment? Above the law. Get outta here. Pardoning Libby's jail sentence is above the law. ardoning Nixon for watergate is above the law. Bush jr arrested for cocaine – but never charged – is above the law. Gore's son got a fair deal that anyone can get. I still cannot believe the nerve of some of you. It makes me sick to think some of you can be so dense to honestly believe Gore's son is "getting away with murder". He is SICK people. Put him in care, not in jail!! "Also, while I agree that inner city youths wouldn’t be treated this way"
Tired of hearing that line of BS as well, how many times do we see where some "disadvantaged youths" commit a dangerous and violent crime only to learn that they have a rap sheet 10 pages long with little or no jail time. We need to stop electing people that appoint these bleeding heart liberal judges. HE WASN'T DWI or DUI! Please read more carefully, and stop reading into the story. He was NOT under the influence. He had POSSESSION only. I would agree with the outrage IF he was DUI/DWI, but he wasn't. Call the boy a Waaaambulance. How'd he get that car to go 100? Was it falling off a cliff? "I tried to take the “high” road, but did anyone notice that CNN left out all the previous infractions? I thank all of you that took all of five minutes to do the research". I don't think I am one of those northeast wingwangs, whatever that means down in the sophisticated state of VA. If it means a liberal, dude, you really missed with that one. CNN should have posted ALL of his previous infractions, to give us the whole story, but they were not "fair and balanced". I do stand by that I hope he gets the help that he needs, but it should not be taken off his record at all. HAVE YOU EVER HEARD OF AN AMERICAN REVOLUTION? WE COULD JUST VOTE THEM ALL OUT. IT'S OUR OWN FAULT FOR PUTTING UP WITH IT. INSTEAD OF THESE LITTLE SILLY PLACES TO BLOW OFF STEAM, GET OFF YOUR DUFF AND DO SOMETHING ABOUT IT. BE LEGAL. So nice to see a level headed, intelligent, well read blogger. I agree with you 100% It seems for many the mention of a Celebs Name brings out the rifles, tomohawks, and blades immediately. Never mind the facts that's immaterial. Like the Bush Mentality: Let'sHung Them Down and Wipe Them Out. Facts, innocence, mitigating circumstances, matter none. They are Big and Rich – And Con Artists – LET GET EM ! Just wondering if you would grant the same leniency to everyone's children? Or, is it because his last name is Gore? "Drug abuse is a medical problem, NOT A CRIME!! And medical problems require treatment, not prison sentences and ugly criminal records. We don’t discriminate against the ill people!!" Do you REALLY believe what you are saying??? You might want to check the state and federal laws – possession of narcotics is a crime. Rightfully so! They are a gateway to many other types of crimes (theft, murder, etc) and have ruined lives and families. Your argument is much like saying SPEEDING isn't a crime – just an anxious need to get your destination. Let's treat those caught speeding with antidepressants! Gore can't even raise his own son right yet people actually want this guy as president running our country. Geez! The REAL story is that nobody knew that a Prius could go 100 mph. Who cares about the rest. The kid is only 24 and made some mistakes. I never said the laws say its not a crime. What I said is that it shouldn't be a crime!!! And if you think having a problem is a crime, then you should be in for a long time. Trying to make an issue like this political, which is exactly what you and other right winged conservatives are trying to pull, is a problem. Get help, and worry about some REAL problems that affect you. He will be taken care of I'm sure of that. This is something that shouldn't even be an issue on this blog. Quite frankly its none of our business. Al Gore's son has his own mind, and those who use his problems to tarnish his father's image are those who have nothing else to attack him on. I love how people are trying to make this an issue of drug abuse. It does not matter what he had on him. Who cares? What matters is that he plead guilty to 2 felony charges and 3 misdemeanor charges and gets off with rehab. I grew 7 plants of marijuana and was charged with 1 felony. But since I am a lowly commoner I did not get rehab I got 3 YEARS in prison. This article goes to show that if you want to break the law wait until you are rich and famous. What you said Michael was "Drug abuse is a medical problem, NOT A CRIME!!" Perhaps you were trying to say that it is your opinion that drug abuse should not be TREATED as a crime. We'll chalk that up to you're not articulating very well. And then you shared, "And if you think having a problem is a crime, then you should be in for a long time." Having a "problem" isn't a crime unless your "problem" is breaking the law. Kleptomania – the "problem" of stealing from others, Serial Murder – the "problem" of killing others, Coke head – the "problem" of using illegal narcotics. Sorry Michael – you will get little sympathy from most of us reasonable Americans. We are sick and tired of the little rich kids (Lindsay Lohan, Paris Hilton, Al jr) breaking the laws and effectively being given preferential treatment. SAD is the mentality which enables these kids by saying "it's not their fault – give them a break..another break...ok a 3rd break". Really Tom of what travesty do you speak? The man has an addiction problem like many others in the world. He had no charges laid against him. He was sent appropriately to a Rehab Centre for Treatment which is the proper place and care for the addicted. I would say Michael from Saint Louis MO is right on the mark. Now if you'd like to speak on Travesties, I would like to start with the Present Administration. How are the Chief and his Co Chief avoiding Jail Time given their records? Hi "Trish" from another country, at what point in your mind does it become a crime for this pampered son of a politician to keep using illegal and illegally purchased drugs? This isn't a one time offense, is he always going to be a poor little addict in your world? He was smoking pot,got caught with drugs with no prescription and driving 100 miles an hour, last time I checked those were criminal offenses. We are not talking about the idiot President here. "The man has an addiction problem like many others in the world. He had no charges laid against him. He was sent appropriately to a Rehab Centre for Treatment which is the proper place and care for the addicted. " This isn't Gore's first offense. He was arrested in 2003 for marijuana possession and "completed substance abuse counseling". In 2002 he was arrested for suspected drunken-driving. Again – is your "solution" to send law-breaking addicts to rehab every time they break the law?